Bringing together luxury, comfort, and a spacious interior, the first-ever BMW 2019 X7 makes its debut as a powerful choice for SUV drivers in Westchester County and Yonkers. Or, as BMW would call it, perhaps more accurately, a Sports Activity Vehicle. The interior seeks to provide an experience that’s welcoming every time you step into the car. In this space, the BMW of Westchester team goes in-depth to take a closer look at those interior features you’ll use each time you drive (or ride) in the X7. The X7 comes with 16-way power front sport seats, which allow you to find that perfect setting for every drive. With the 2-way power side bolster and 4-way lumbar support, along with a memory system for the seat and steering wheel, you’ll be in complete control of the X7. The main difference between the X7 and the BMW X5 is the addition of a third-row seat. With room for up to seven people, bring along the entire family on every ride. Everyone inside will be satisfied at all times thanks to the automatic 4-zone climate control. With climate settings for the driver, front passenger, second row, and third row, set the interior temperature to your liking no matter where you are. From the standard safety features to the driver assistance systems, the X7 is ready for the road ahead. The BMW Intelligent Assistant puts you in charge of navigation, entertainment, and other vehicle controls on the BMW iDrive 7.0 system. All you need to do is say “Hey BMW,” or pick a personalized name, and the system will respond to your every command. Now that’s a truly intelligent assistant. With the available Parking Assistance Package, the X7 will take care of a difficult parallel parking situation. You control the accelerator and brakes, and the system will handle the steering wheel. Get in or out of any spot with ease thanks to this feature. Apple CarPlay® compatibility comes standard, with a 1-year trial paired with it. Use the touchscreen to connect your iPhone®, and have simple access to text messages, navigation features, and music, too. When you glance at the touchscreen, it’ll even look similar to your phone. 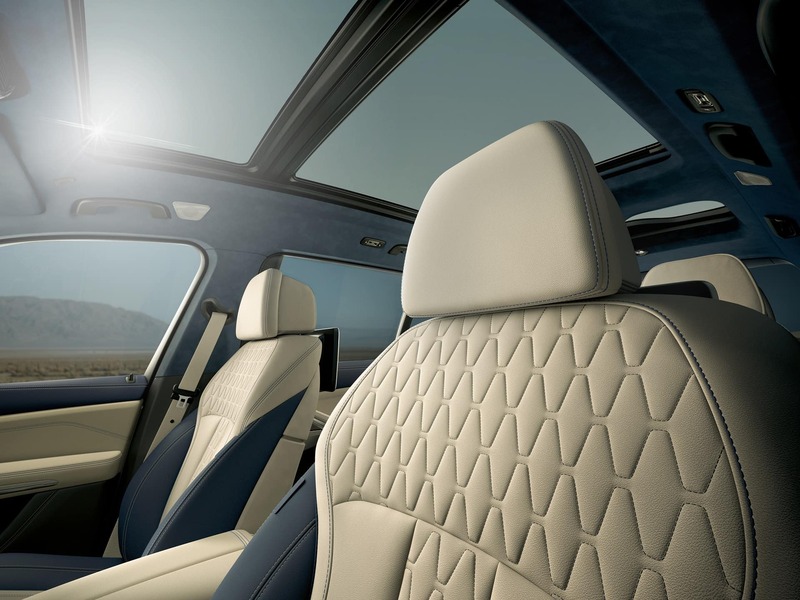 Settle in and bask in the glory of the panoramic glass roof, which opens up to let in fresh air and sunshine. This creates a more spacious feeling inside the cabin, with effects added through the available panoramic LED roof. This roof changes color to set the mood for the ride. While the seating for seven with second-row bench seats is the standard setup in the X7, you can also choose the available captain’s chairs. These all-electric second-row captain’s chairs max out seating at six, but provide an extra level of comfort. Though we’ve only covered the 2019 BMW X7 cabin, it should be mentioned that this is a powerful car, too. The X7 can deliver 335 horsepower with its base setup, and up to 456 horsepower overall. Pair that power with the well-appointed interior, and you have a car that’s ready for Westchester County and Yonkers roads. Visit BMW of Westchester for a test drive today, and we’ll show you everything this car has to offer, from top to bottom, inside and out.